Here you will find some answers to frequently asked questions. But we would be happy to help you personally! Just contact us. 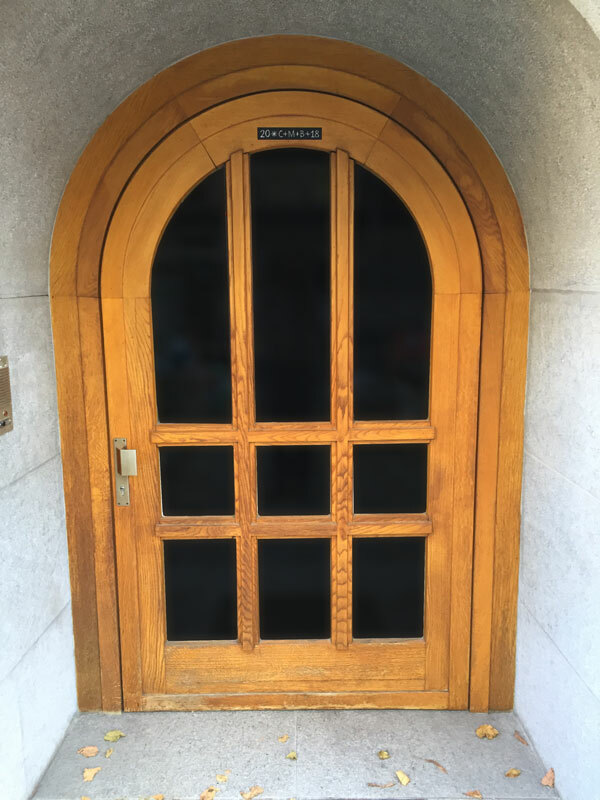 Front door bangs or doesn’t close completely? Front doors that bang or don’t close completely – especially in combination with an overhead door closer – can be quite annoying. But they are no problem for DICTATOR door dampers. 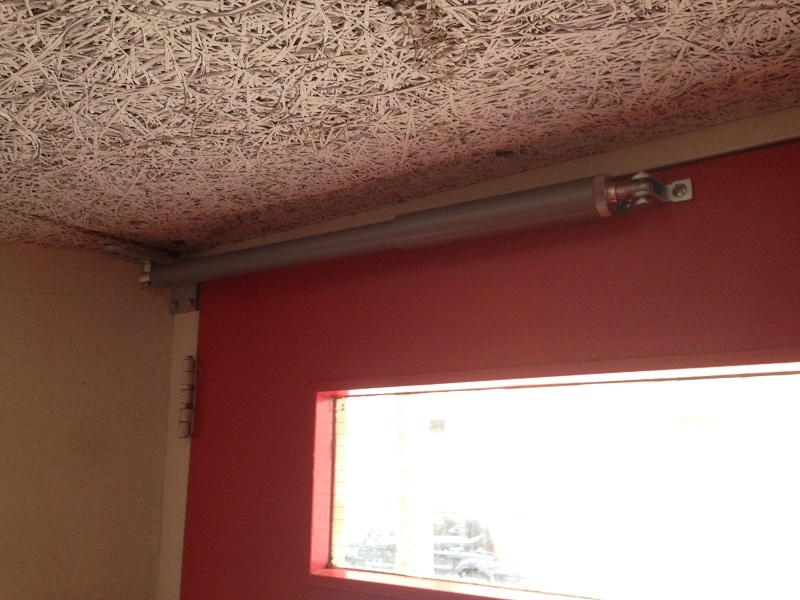 Whether there is an overhead door closer or not, it always makes sure the door closes quietly and reliably. 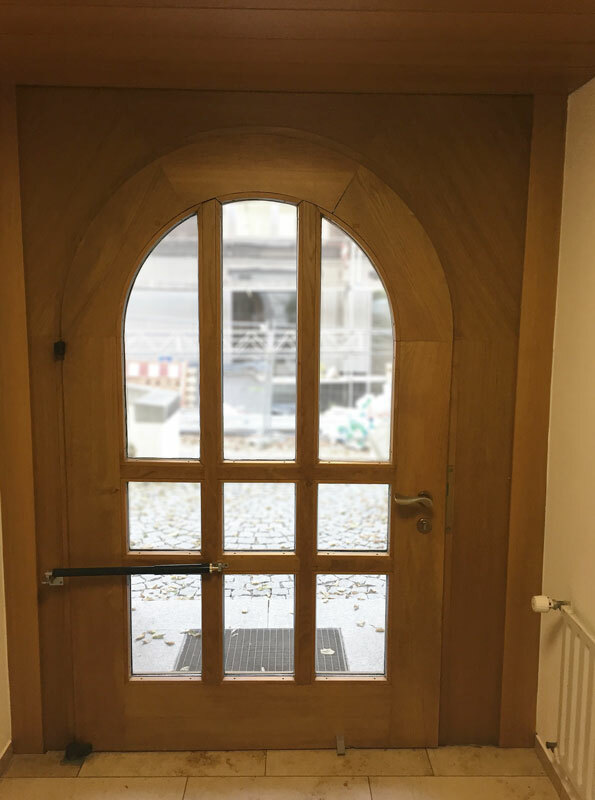 But what to do if there is no space for the hook above the door or if the door features a large glass pannel in which you cannot fix the door damper vertically? 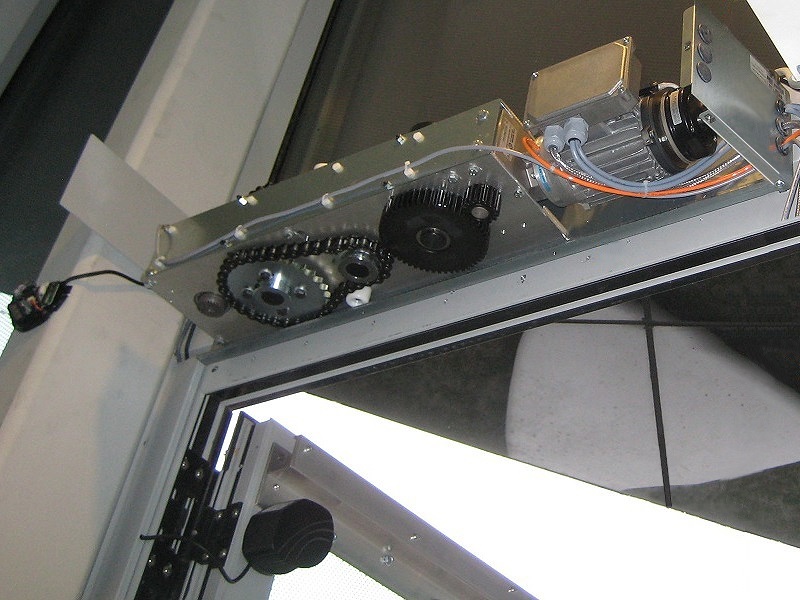 In this case, you can use the door damper VS 2000, since the standard model can also be mounted horizontally. The version with 20 N spring used to be the ‘normal’ one, however, due to the new Heat Insulation Ordinance, doors are now better insulated and thus have become heavier and thicker. Also, additional sealings make closing the door more difficult and therefore a VS 2000 with a closing force of 20 N is often not strong enough. A model with a 50 N spring would easily prevent the door from banging and would close it completely, BUT for some users the force required to open the door would be too high. The DICTATOR answer to this problem: since mid 2017 DICTATOR provides the door damper VS 2000 also with a closing force of 35 N. And, since then, these unresolved cases are a thing of the past. 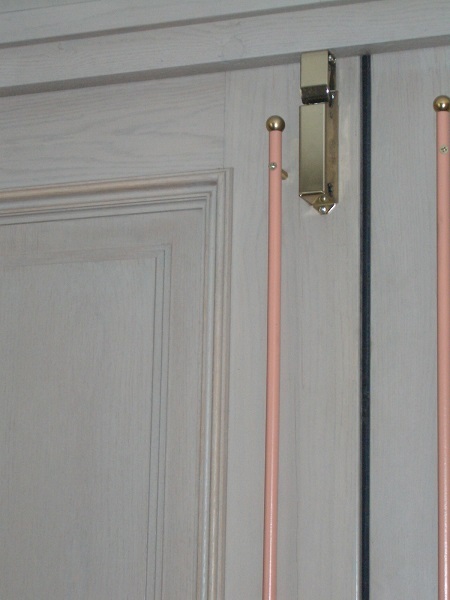 The door damper VS 2000 is placed directly at the closing edge, as there is not enough space for the hook above the door. This is no problem with a 35 N closing spring. How can a sliding door be opened without an electric door operator? Normally, the task of a door closer is to close a door automatically. 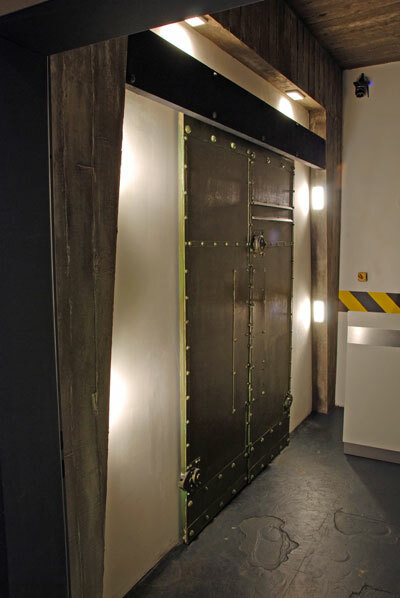 In the case of this “escape” doors in the Twisted Rooms Hamburg, however, a double sliding door should open automatically but mechanically – without the need of electricity – in order to allow the people to exit the room after they’ve solved the puzzle. Both leaves should open in sync, slowly and quietly. And all this without using an electric door operator. 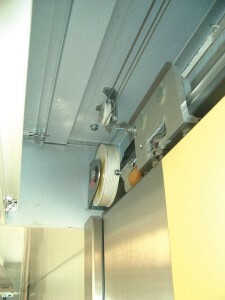 The sliding door was equipped with the DICTAMAT 50 BK-Z. Normally, it works as a sliding door closer, but for this application in the Escape Room it was converted into a door opener. Both leaves are opened with one DICTAMAT 50 BK-Z. The speed is steplessly adjustable and can therefore be adapted to the exact requirements. Under the link, you’ll find more information about this application for a mechanical door opener for Escape Room doors. 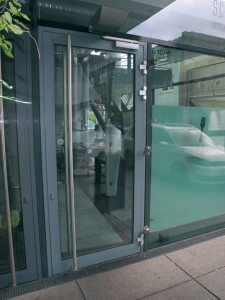 Normal hinged door operators may not be able to cope with hinged doors opening to the outside and therefore in part exposed to high wind loads. 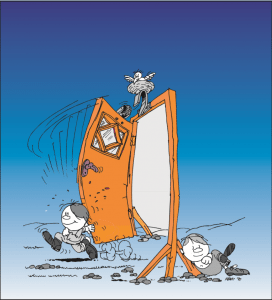 The wind prevents the correct opening and closing and in the worst case causes damage to the door and the façade, even people might get injured. 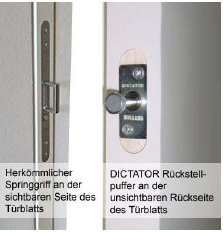 For such applications DICTATOR offers a special hinged door operator, the DICTAMAT 310-21. Two models are available: with 200 Nm and 700 Nm. The stronger model braves winds of up to 9 Beaufort. The driving unit achieves its power by means of a special gearbox. Safety sensors which supervise the whole door area ensure the safety. The special gearbox of the stronger model together with a 0.18 kW motor generates a force of 700 Nm. The R1400 door check is mounted on the closing face of the door. For this type of mounting the lintel should start just above the door leaf, because the hook is normally fixed to the lintel. However, this is not always the case because the door leaf is often flush with the frame. DICTATOR solved this problem with a small, inconspicuous bracket. It allows to mount the hook on a flush frame. The bracket facilitates the individual positioning of hook and door check, thus considerably expanding the application possibilities of the R1400 door check. Normal type of mounting: here the hook can be fixed directly to the lintel. 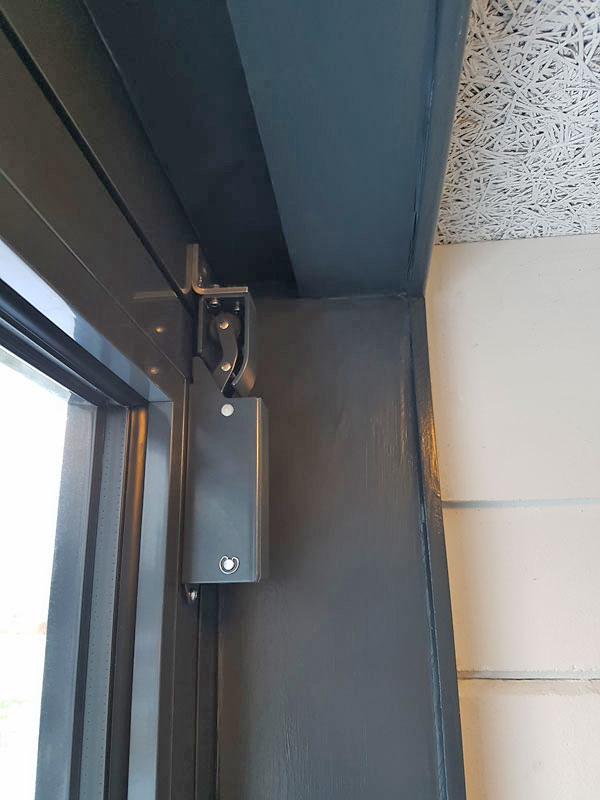 By means of the bracket, the R1400 door check can be also used on doors where the lintel is too far above the door leaf or don’t have any lintel. 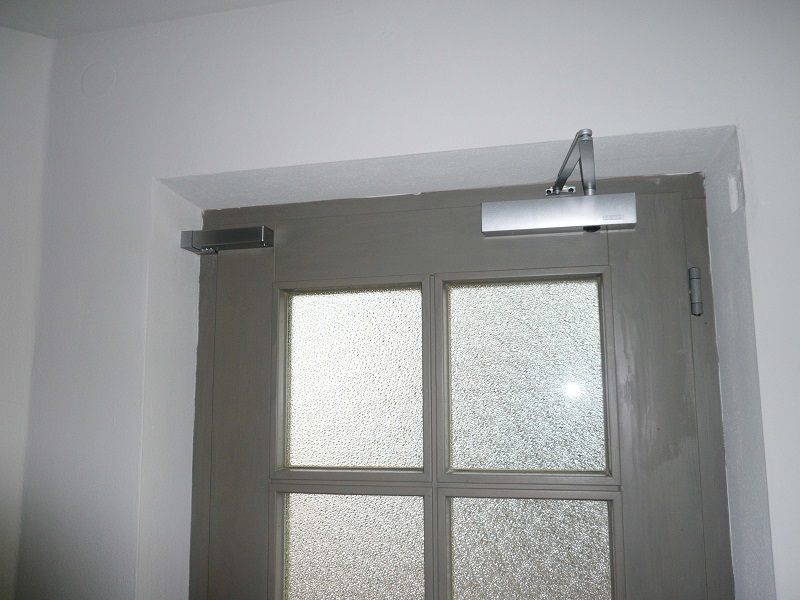 Normally it is not possible to install traditional overhead door closers onto arched doors (or only when “inventing” a special construction). And this would considerably affect the special aesthetics of an arched door. And, when the arch is pronounced, there is virtually no possibility. With the DIREKT door closer this problem can be easily solved. It doesn’t require any lever arms. One end is fixed to the door frame or the wall and the other one on the door leaf. The closing speed can be adjusted exactly to the requirements on site. And the DIREKT door closer makes sure the door is always reliably closed. Until recently, a sign reminded users to always close the door, because it is normally not possible to mount an overhead door closer on such a distinctive arched door. Overhead door closers are very difficult to install on arched doors. Thanks to the door closer DIREKT, the door now closes automatically. DICTATOR also calculated the exact fixing points for the DIREKT as part of their service. Entrance doors – also side entrances – should normally be securely closed. But what to do if there is no space above the door for mounting a normal overhead door closer? The door closer DIREKT solves this problem. One of its ends is fixed to the door frame and the other directly on the door leaf. Its closing speed can be ajusted exactly to the requirements on site. It is also possible to adjust the closing speed and even close the door very slowly. Sliding doors shall always close automatically, without current. Is there a mechanical door closer without much maintenance? 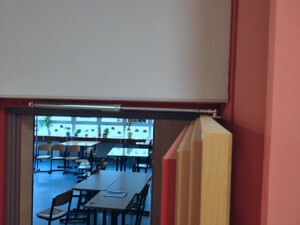 to prevent unnecessary heating due to temperature loss because the door is opened. to optimize the use of air conditioning in cold aisle containments for server installations or data processing centres. to ensure privacy and an optimum working and hygienic conditions in examination and emergency rooms of hospitals. …and many more (as e.g. 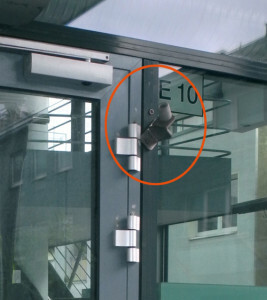 to prevent birds from flying into a building, e.g. in a church). An automated door operator needs electricity. This means that an electrical connection is required on every door and power is consumed. And a door operator on a highly frequented door needs to be serviced often. The mechanical door closer for sliding doors DICTAMAT 50 easily adapts to the respective door situation – thanks to the many models. The DICTAMAT 50 needs no electricity for closing – no connection to the mains is required. The closing speed is adjustable, thus ensuring optimal safety for people and goods. The sliding door closer DICTAMAT 50 adapts to the conditions. Often front doors equipped with an overhead door closer close too fast and with a loud bang – or they don’t close completely. In appartment blocks this often causes discomfort, e.g. when the banging front door interrupts a neighbour’s sleep. A front door that closes too fast also makes it difficult to pass through with e.g. shopping bags or with a stroller. Also people who are not so fast anymore may have trouble passing through the door without being pushed. 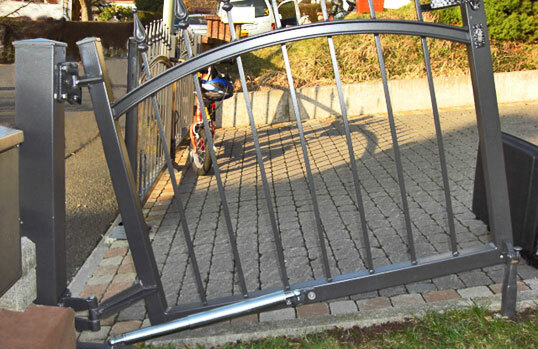 The gate closer DIREKT is often used for gates in fences, however, it is also suitable for front doors or entrance doors. It provides a steady, slow closing and makes sure the door closes completely – without loud noises and in spite of its low closing speed. This not only prevents the annoyance due to noise but also injuries due to the banging of the door. The gate closer DIREKT can also be retrofitted and its external adjusting possibility allows to adjust the closing speed exactly . Gates with ascending hinges close too fast. How to slow them down? The property is situated on an ascending terrain. The gate(s) must have ascending hinges to allow opening them. However, when closed without manual control, the gates will develop a high speed, thus having a great risk of accident. The DICTATOR oil damper makes sure that the gate is closed in a controlled way at a speed adjusted on site, thus making sure nothing is damaged and nobody gets hurt. Every restaurant, canteen and food store has a cold storage. 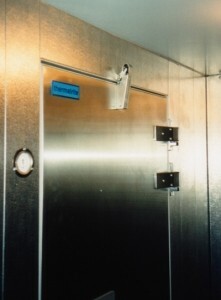 As a rule, smaller cold storages have hinged doors. Since everybody is usually in a hurry, they don’t always pay attention that the doors are really completely closed. Also, due to the seals, the doors don’t close easily on their own. Through the remaining gap the cold air can escape, the cold storage becomes too warm and expensive energy is lost. DICTATOR door checks make sure that the closing door is always reliably and completely closed. The user doesn’t have to make sure anymore that the door is really completely closed. He saves time, the routines become faster, and the door is always closed and energy saved. 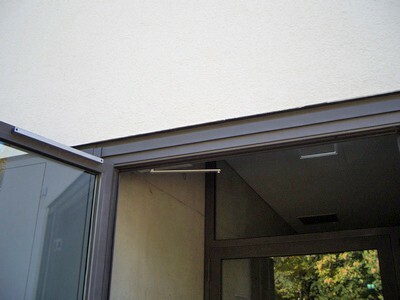 Open sliding doors disappear completely in a wall pocket – but how to retrieve them? In house building sliding doors are on the rise. Especially attractive are sliding doors which completely disappear in wall pockets and thus open the whole passage. But how to retrieve them? There are special handles sunk in the front face of the door that are available for this purpose. 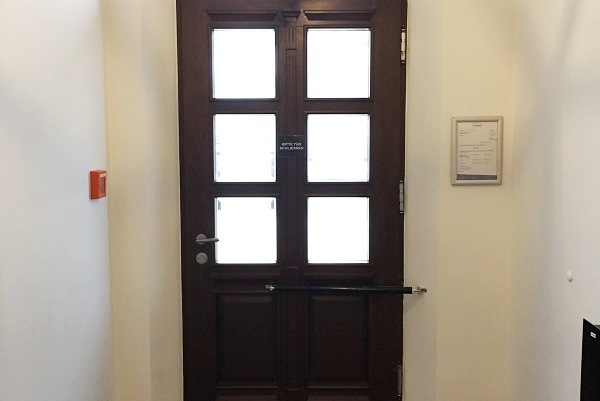 In order to close the door, they first have to be folded out – and afterwards have to be folded back as otherwise the door won’t close completely. A very troublesome procedure! The DICTATOR release buffer offers an invisible solution wich is extremely easy to handle: a short, slight pressure on the front face of the door is sufficient to let the door come out of the wall pocket. 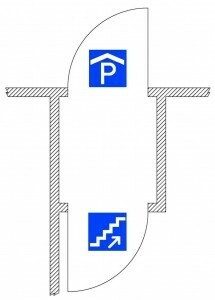 How to limit the opening angle of emergency exit doors or doors in public buildings – without door stop on the floor? The DICTATOR back checks are fixed on top of the door to the door and the frame. They make sure that the doors don’t open in an uncontrolled manner and they limit the opening angle so the doors cannot hit walls, façades, windows etc. and damage them. Gusts of wind knock hinged doors open – What can be done? Many buildings have doors that open to the outside (e.g. emergency exit doors, entrance doors of public buildings, etc). When these doors are knocked open by gusts of wind, heavy damage can occur. The door is knocked open by a gust of wind or by storm and crashes into the façade or an object being in the range of the door (e.g. a car). The consequences: torn-out hinges, damaged overhead door closers, broken panes in case of glass doors, damaged façades etc. The opening door hits a passerby or is torn out of the hand of the person who is opening it. This can cause considerable injuries. Mounting a back check – with or without regulation. As soon as the opening speed of the door leaf exceeds a certain value, the back check goes into action and slows the opening motion of the door to a controlled speed. There is an appropriate model for every application. 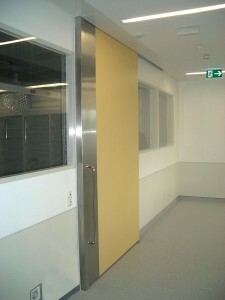 The doors form a fire protection airlock where two fire doors are situated within a short distance. 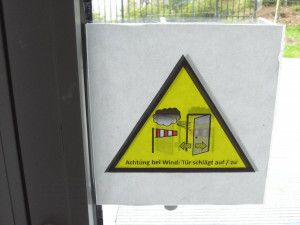 When the first door is opened and closed again while the second door remains closed, an air cushion develops which may prevent the complete closing of the door. However, when the second door is open, the first door often closes with a loud bang. An access door to a small room with a window. Depending on whether the window is open or closed, the same aforementioned situation can occur. By now, many manufacturers of fire protection or smoke control doors have included the DICTATOR door check in their door approval or manufacturer’s declaration as complement to the spring hinge or the overhead door closer. The DICTATOR V1600F back check assures the final closing of the door by pulling it until it is securely closed. There won’t be no more partially open fire doors. But it also prevents the door to close with a loud bang in case both doors are open. How to silence banging doors? Banging doors happen to be everywhere: in offices, hospitals, authorities, hotels, apartment complexes, multi-family houses, parking garages etc. The DICTATOR door checks stop this annoyance in a simple, reliable and effective way. There is an appropriate model for every application. 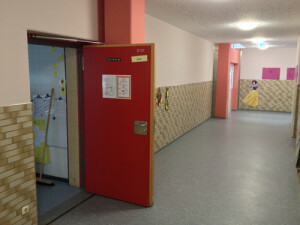 Doors of schools, nurseries and kindergartens often have to stand the rush of the children who want to leave as fast as possible. The doors are knocked open regardless of the consequences. Even door closers with opening damping can’t withstand such a rush. The DICTATOR back checks make sure that the doors cannot be knocked open. When the door is opened at a normal speed, the back check isn’t even noticeable. It doesn’t increase the effort to open the door. However, as soon as the door is opened at high speed, the back check enters into action and effectively dampens the door movement.